This is an example for the way our stand for the tire fair 2016 will look like. It will be located at Galeria stand 137 from 23.05 to 27.05.2016. We are grateful for every customer we can inform about our product. 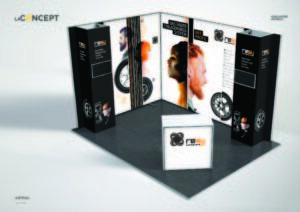 We are presenting our product and looking forward to your visit at Galeria stand 137. 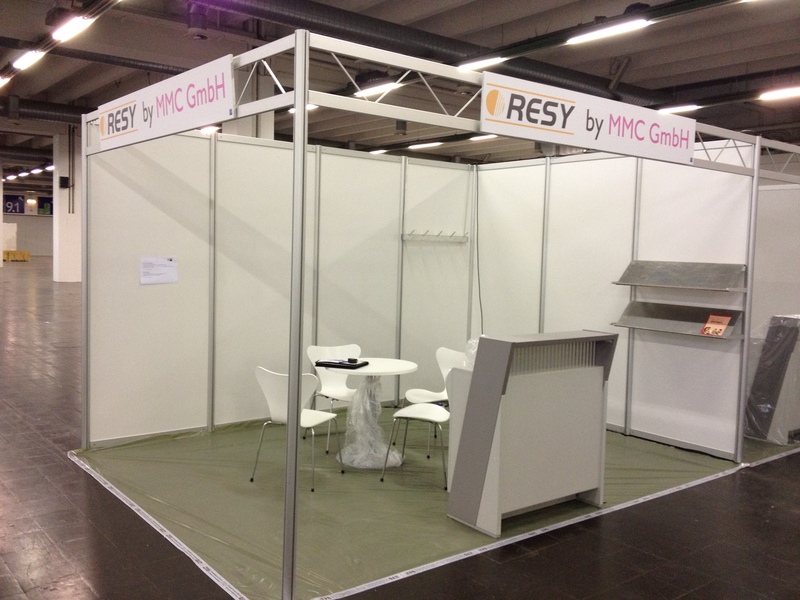 RESY at the “Reifen 2014”! During the time of the 27th to the 30th May, MMC was represented by the software for warehousing tires RESY. A lot of visitors were able to convince themselfes, during the world leading fair for the tire industry, of the efficency of the RESY-Software. Especially the easy way of capturing the tires by scanning the barcode that allows to transfer customer data effortlessly via WLAN into the system and leaves the inconvenient tracking per Excel-List in the past, amazed all interested parties. One mouse click and the in the booth integrated thermal transfer printer delivers the labels including license plate, customer name and ID as well as the labels for the encampment. Once provided with a label, the encampment and tires are scanned with the MDE-device or the RESY-App so that the data can be transferred to the RESY-System. Therefore, RESY always knows where the wheelsets are located, which work is already done and which is yet to be done. Tire dealers along with CEO’s of big cart dealerships have been equally fascinated by the rapid capturing of important data and their transfer into the RESY-System. “We were able to convince many visitors of the innovative vigor of our product and thus are very pleased by the positive responses we heard duriung personal dialogues.”, so Michael Müller, CEO of MMC GmbH. We present RESY on the tire fair in Essen from the 05.06 to the 08.06.2012 in hall 9.0 at the stand 216. Everyone interested is cordially invited to convince oneself of the scope of performance of our software. You can come and visit us spontaneously or arrange an appointment. 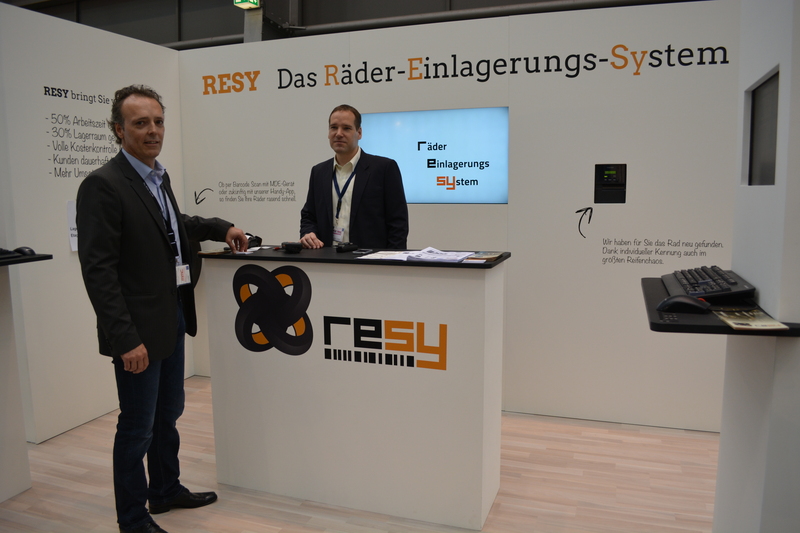 The newest version of RESY is able to carry out the wheel inspection solely with our mobile data acqusition device. The employees will be able to collect the data of the tires at any given place. The data will be synchronized via WLAN and is then accessible in RESY. From now on, you are able to release one or more hoists for the online booking of appointments. The work that is bookable via the internet is determined and regulated freely. Those are available for your customers together with the spare appointments on your website for the customers. Now you are able to manage hire vehicles in RESY and book them for your customers during the scheduling of the appointment. The new feature allows you to set up any number of vehicles you can budget for your customers. RESY produces and prints automatically the certificate of hiring and return. From now on you are able to consign during the scheduling whether your customer is to be reminded via SMS regarding the upcoming appointment. Therefore, you only have to set a check mark and the rest will be effected automatically. 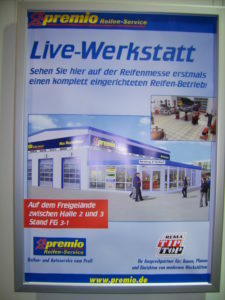 We are present in the “Premio Live-Werkstatt” on the open-air area between hall 2 and hall3 until the 04.06.2010 together with the company PPS. Our new system for greeting the customers gives the possibility of a professional customer approach as early as entering the enterprise.